Visit the Richmond Columbian Properties new webpage at http://richmondcolumbianproperties.org/. About Richmond Columbian Properties, Inc.
Richmond Columbian Properties was originally founded as holding company for the Richmond Knights of Columbus Council. It bought the William G. Scott House in 1921 from his granddaughter. Eventually the Knights of Columbus vacated the building to operate from Holy Family Church. Richmond Columbian Properties then decided to keep ownership of the building and operate it as a center for historic preservation education and neighborhood revitalization. Richmond Columbian Properties is a 501C.3 non-profit. The organization has developed education programs and events related to preservation issues and Richmond, Wayne County, and Indiana history. It has partnered with other cultural organizations for programming and advocacy. The facilities are available for private functions and non-profits events. We will assist any non-profit group in their mission to help the people of Richmond, Wayne County and the surrounding area. The goal of Richmond Columbian Properties is to continue the history of service started in this building, by the Knights of Columbus, with its focus on improving our community. 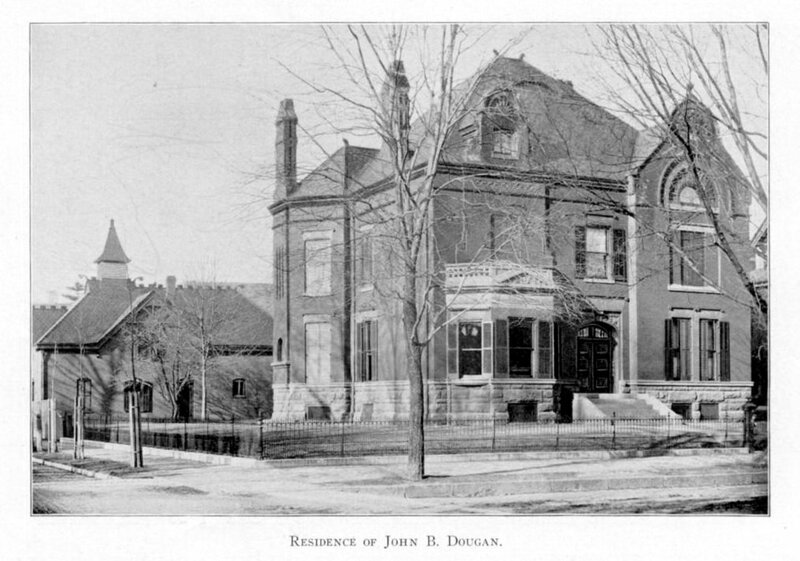 View a historical photo of William G. Scott Home from Dalbey's 1906 "Pictorial History of Richmond, Indiana." When a man passes away we look back over the life ended and note its usefulness — its points worthy of emulation and perpetuation. What William G. Scott did for his fellow men might, in a manner, be told in words, but in its far-reaching influences cannot be measured. Many business concerns and moral enterprises owe their excellence and progress largely to his influence. He was in touch with the people, and from a sincere and deep-felt interest in their welfare labored for all that would prove of public benefit until the busy and useful life was ended. Mr. Scott was born in Harrisonburg, Rockingham County, Virginia, September 17, 1824, and was a son of John and Sarah (Logan) Scott, who were native of the County Monaghan, Ireland, and, crossing the Atlantic to the New World, located in Virginia in 1826. There they resided until 1827, when they removed to Richmond, Indiana, until 1838, when he removed to Ft. Wayne, this state. To the public schools of those cities William G. Scott was indebted for the education privileges which he received, but he put aside his textbooks when sixteen years of age in order to assist his uncle in the Land Office at Ft. Wayne, in which Mr. Reid was Receiver. In 1844 he returned to Richmond and soon afterward entered the employ of J. M. & J. H. Hutton, foundrymen, under whose direction he learned the moulder's trade. On the 3rd of June 1847, Mr. Scott married Miss Malinda Gaar, a daughter of Jonas Gaar. She lived only a year after their marriage, and their only child died a few months later. In 1849 he joined his father-in-law, Mr. Gaar, together with the latter's two sons, Abram and John Milton, in the formation of the firm of A. Gaar & Company. They purchased the Hutton Foundry and Mr. Scott became the first bookkeeper and one of the original promoters and leading spirits in the mammoth enterprise that is now conducted under the name of Gaar, Scot & Company. In 1870 the business was incorporated under the name now used, the officers being Abram Gaar, President; William G. Scott, Secretary; and J. M. Gaar, Treasurer. These young men began business with very little capital, but a gradual and substantial growth has transformed the plant from its original proportions to one of the most extensive of the kind in the world. They were all practical mechanics and thus capable of directing labors of others. Their force of workmen was increased from time to time in order to meet the growing demand of the trade, until at length several hundred names were on their payroll, and the boilers, engines, sawmills and threshing machines which are manufactured are sent into every state in the Union, besides into a number of foreign ports. The phenomenal growth and success of the enterprise was attributable in no small degree to the sagacity, energy and wise business policy of Mr. Scott, whose judgement in all business matters was most reliable. He served as Secretary of the company until his death, and took an active part in the management of the extensive foundry business which has proved such and important factor in the up-building of Richmond. His labors, however, were not confined to one line of endeavor, but were an essential element in the prosperity of many other successful business concerns of the city. In 1872, when the Second National Bank of Richmond was organized, he became Vice President, and filled that position until 1895, when he was elected President of the bank, acting in the latter capacity until his death. He was also President of the Wayne Agricultural Works, and whatever he undertook he carried forward to successful completion. He held a high position in business circles in the community for nearly fifty years, and his activity in that direction justly entitles him to be numbered among the founder of Richmond, for it is those who promote commercial and industrial activity who are the real builders of a place. Mr. Scott was a second time married about 1850, the lady of his choice being Miss Betsy Rogers, by whom he had three children, viz: Charles E. and Clara R., who are now deceased, and Helen L., wife of John B. Dougan, Vice President of the Second National Bank of Richmond, and one of the leading businessmen of Wayne County. The mother died in 1863, and in 1864 Mr. Scott married Clara McCoy, daughter of Colonel W. F. Robie, of Plymouth, New Hampshire. She survives her husband and resides at Richmond. Mr. Scott was reared in the Presbyterian faith, but afterward became a member of the Methodist Episcopal Church, with which he was connected until about 1862. He then returned to the Presbyterians and it was largely through his liberal donation that the house of worship belonging to the First Presbyterian Church was built. He withheld his support from no philanthropic or benevolent movements or enterprises for the public good, aided in building all the churches in Richmond and labored earnestly for the betterment of mankind, realizing most fully that financial success, fame or high position count for naught unless supplemented by an upright, honorable character. He had a mind above all personal considerations, concerned with those large, loving interests belonging to humanity. He passed away November 18, 1897, at the age of seventy-three years, but in the hearts of his friends are enshrined many pleasant memories of him, and his influence for good remains with those who knew him. Source: Biographical History of Fayette, Franklin, Union and Wayne Counties, Indiana, Originally Published in 1899 by Lewis Publishing Co. The factory of Gaar, Scott & Co. had its beginning, in 1836, in what was known to Richmond's pioneers as the Spring Foundry, located on the site of the present large plant and removed in 1836 to make room for the machine shop. Spring Foundry was so named because the water supply that furnished the motive power for this primitive enterprise was obtained from springs. The first proprietor of Spring Foundry was Isaac E. Jones, who used the building principally for a stove foundry. In 1839 it passed into the hands of Jesse M. and John H. Hutton. Among the operatives were Jonas Gaar, machinist; Abram Gaar, carpenter and millwright; J. M. Gaar, machinist, and William G. Scott, molder. These mechanics assisted in bringing out the first thresher ever built in Indiana. This machine was known as a "chaff piler" or "groundhog" thresher, which simply threshed the wheat, and was operated by horse power. These machines were first put on the market in 1841 and continued to he the principal product of the factory up to 1848, at which time they developed an improved grain separator, which threshed the wheat from the shock and separated it from the straw which was deposited on the ground to be "bucked" away. In 1849 these pioneers in the threshing-machine industry bought the factory from the Muttons and organized the firm of A. Gaar & Co. Under their able management this infant industry soon outgrew its swaddling clothes. In 1870, twenty-one years after the Gaars took control, its majority was celebrated by incorporation under the name of Gaar, Scott & Co., with Abram Gaar, president; J. M. Gaar, vice-president, and William G. Scott, secretary and treasurer. On the death of Abram Gaar, in 1894, J. M. Gaar succeeded to the presidency of the company. The present officers (November, 1911) are: Howard Campbell, president and general manager, who succeeded J. M. Gaar at his death, in 1900; S. S. Strattan, Jr., secretary, who succeeded William G. Scott, deceased in 1897; Frank Land, first vice-president; William H. Campbell, second vice-president, and Charles H. Land, treasurer. The early captains of industry who, founded this successful manufacturing enterprise, and their successors of the modern school of business, have always kept it at the head of Richmond's splendid manufactories and among the very first in its line in the United States. Over 600 men find steady employment in their well equipped factory and their total annual pay-roll is about $450,000. Threshers, traction and portable engines are their principle product, including large steam plowing engines, but they also build clover hullers, saw mills and straw bruisers, the last for export only. Their trade, which was at first local and amounted to only a few thousand dollars a year, has expanded until, as their announcements say, "Gaar-Scott threshing machinery goes wherever straw grain grows." In the wheat belts of Canada and Mexico their machinery is as well known as in the United States, and they enjoy a growing export trade in South America, Egypt, Russia, and other European countries. Source: "Memoirs of Wayne County and the city of Richmond, Indiana; from the earliest historical times down to the present, including a genealogical and biographical record of representative families in Wayne County", Henry Clay Fox; Western Historical Association, Madison, Wis., 1912. Barry Manilow began his career playing piano at the Holiday Inn in Richmond, Indiana.